Besides these bibs being super stylish and cute they help protect your child's clothes from getting dirty and drooling all over the place. 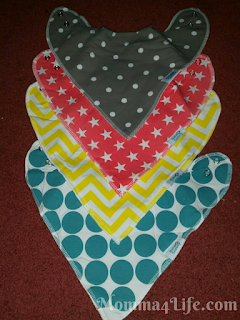 They are made really well and hardly take up any space in your diaper bag. Shipping was super fast if you have Amazon Prime. Let's talk about these designs they are super cute and they have designs for boys and girls!!! If your looking for protection. These are super cute. We highly recommend these. They are very colorful and easy to see and wash really well also.